With .22LR ammo still being in short supply in my neck of the woods, who in their right mind would embark on project rifle in this caliber? I still don't know why I let myself get fixated on this, but you know how it goes - sometimes you get an idea and can't shake it until you see it through. That idea was to buy or build a takedown .22 rifle that I could stash behind the rear seat of my F150 supercrew. So in this mult-part article, I'm going to take a look at the options I reviewed, the solution I settled on, the process of tricking it out, and the performance results from the range, including some fun with a red-dot site. Then we'll finally discuss storage options. Recently I purchased and installed a molle cover for the rear seat of my F150 from Sunrise Tactical Gear. They cost about $100, and are one of the most practical accessories dollar-for-dollar that you can get for an F150. Really. In a nut shell, the seat cover lets you attach any number of molle pouches to the underside of your rear seat. The existing space under the rear seat gives enough clearance that the pouches and their contents aren't crushed when the seat is lowered back down. I use this system to store key components for what's known these days as a 72-hour or walk-away bag. Things like water purification, EMT bag, fixed blade, hand warmers, multitool, space blanket, compass, etc. Most people's reaction to seeing this is that, hey, why couldn't you store a shotgun or AR on that thing? Well, of course you could. Space is obviously at a premium, but it got me thinking. A better solution might be to stash a truck gun BEHIND the rear seat. Doing what's known as the "Rear Seat Mod" in the F150 community, you can get convenient access to a small amount of otherwise unusable storage space between the rear wall of the cab and the seat back. It's not a lot of space. For that reason, I started thinking about takedown .22 platforms that might fit in there. While a .22 may not be much help storming the Bastille, it's a great small game rifle. Hey, I'm not planning for some theoretical zombie apocalypse, just after something that can get food in a pinch, and augment other personal defense solutions. The solution is divided into two main parts - identifying the gun, and storing it effectively. The latter turns out to be the more difficult, the former more fun, so this series of posts will begin with buying and tricking out a gun. Selecting the gun for this project gave me the opportunity to revisit the current and impressive selection of "survival" .22s and new takedown offerings. The selection process was one of elimination, really. There are myriad articles discussing the pros and cons of these guns, so I'll just summarize my conclusions here. The venerable AR7 has been around for decades, and I owned a Charter Arms version for a while, so I have some experience with the system. Henry reportedly (and I'm sure) builds a better version today. It's claim to fame is that the whole thing can be stored in the buttstock, making for very compact and resilient storage, and that it floats. Note, however, that it's not waterproof, so there's a time limit on that float. 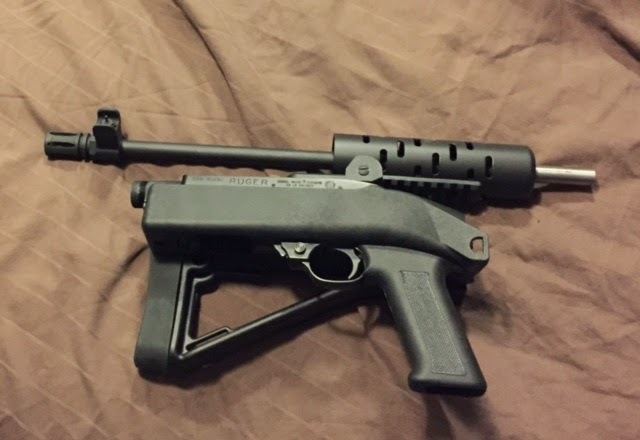 The offset rear site, lack of a forend, lack of a threaded barrel, and lack of accurizing options, and somewhat finicky ammo needs removed this from my list. That said, at about $250-350 MSRP based on coatings, it's an attractive option. Being self-contained in its own stock easily solves the storage issue in my project. Both the receiver and barrel are thus protected while being knocked around in a truck. Because of this, it ranks as my second choice for this project. Marlin's Papoose is a pretty slick setup. They offer a floating case, and if your use-case makes flotation storage a priority (what, spilling your canoe? ), this is on your shortlist next to the AR7. 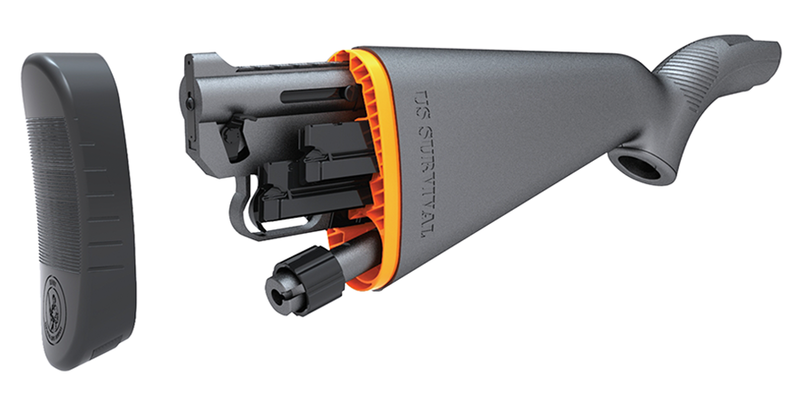 I like the "last shot bolt hold-open" that the 70P offers - different from 10/22 behavior, but you can imagine many of my objections remain the same as above - lack of forend, no threaded barrel, limited accurizing options and aftermarket accessories. 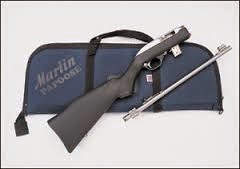 At around $350 MSRP, for about $50 more you can get a 10/22 takedown, and it's hard for me to see why the Marlin presents a more compelling case. Well, literally, it's the floating case, which is nothing more than a curiosity to me. Ruger's 10/22 Takedown might be the obvious choice. The original 10/22 provides nearly endless options for aftermarket accessorizing and accurizing. Some of these will not be compatible with the takedown version, but you can certainly upgrade the fit of the takedown mechanism, add a folding stock, upgrade the internals, and add higher capacity magazines than either the 70P or AR7 offer. So what don't I like about the Ruger 10/22 Takedown? These are nits and it almost comes down to what I preferred about the next option. You know that ubiquitous and obligatory walnut-stocked 10/22 that everyone has collecting dust in their cabinet? For about $200, AGP Arms offers a kit for converting it into a composite takedown. That's the base price. Believe me, it goes up from there based on the accessories you buy with it, some of which are worth it and some of which you should stay away from, which I'll detail later. So what do I like about this? All the advantages of a 10/22, with an arguably better takedown setup than Ruger's factory solution. This is what I ultimately went with, and the photo to the left was taken after dropping my receiver into the AGP folding stock. The barrel is 16", add maybe 1.5" with the flash suppressor. So it offers a very compact setup, gives me the threaded barrel, a forend/barrel shroud, and all the accurizing and aftermarket options inherent to the 10/22 platform. I should note here a couple nits I have about the stock and takedown models 10/22 that the AGP kit addresses. First, the site radius on 10/22 is shorter than I like, with the rear site being dovetailed into the barrel ahead of the receiver. The AGP kit includes a stainless 16" barrel without that dovetail, and there are preferable rear site options I'll detail in Part II. Additionally, the barrel band around the factory 10/22's forend means you're certainly not free-floated, and I think I can safely say that the AGP kit effectively free-floats the barrel. Whether this really matters on a .22 rifle in most use-cases is debatable, but I certainly like it better than the barrel band. Additionally, the pistol grip and folding stock are nice additions that I would probably add to a Ruger Takedown anyway. So that's the field I looked at and how I ended up pursuing the AGP Arms takedown conversion kit. Since I already owned a 10/22, the AGP kit also allowed me to save a little money put my money into other 10/22 upgrades. In Part II, I'll detail the assembly process of the AGP kit, taking a critical look at some of the accessories that they sell with the kit that you'd be better off avoiding, and look at some parts from KIDD Innovative Design that will turn your 10/22 into a real rifle. Thoughts on the above options or questions about some of my points? Feel free to comment below!